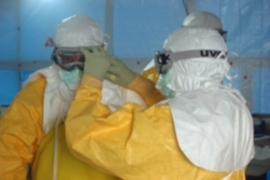 Bryony Ashcroft 9 May 2012 9 May 2012 No Comments on Which countries offer universal healthcare? Universal healthcare or universal coverage has featured heavily in the news lately. There has been much discussion about “Obamacare” and the introduction in 2014 of a universal healthcare system in the U.S. So if you’re moving abroad what do you know about the healthcare system in your destination? 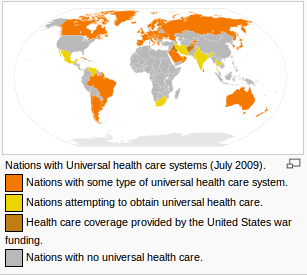 There is a form of universal healthcare in 32 of the 33 developed nations (with the U.S being the exception). South Africa, Mexico, India, Venezuela and Thailand are in the process of implementing a universal healthcare system. Universal health coverage is not a one size fits all policy and different countries have slightly different systems. In two-tier systems the government provides residents with a medically necessary but basic health insurance. This runs parallel to a second tier where people can purchase additional health coverage for treatments not available on the publicly funded system. This private coverage could mean shorter waiting times and better quality depending on how the system is administered. Some publicly funded universal healthcare systems provide an excellent service and therefore the private system is small and the difference in quality is minimal. Other countries have a public system that is underfunded, leaving the private system to provide better quality service, but at a higher cost. Countries with two-tier universal healthcare: Ireland, Singapore, Canada, Israel, UK, Taiwan, Denmark, France, Germany, Netherlands, Australia, New Zealand and Switzerland. In some countries with universal healthcare the government requires all residents to purchase health insurance. Insurance can be purchased from private public or nonprofit insurers. In some countries the choice of insurers can be quite restricted, but in others there is a large private insurance market that is regulated by the state. In this type of system insurers cannot refuse to insure people with pre-existing conditions. Countries with insurance mandates: Germany, Austria, Belgium, Greece, Luxembourg, South Korea, Switzerland and the U.S. Some countries offer a form of subsidised healthcare to residents but it isn’t as developed as those systems seen in Europe for example. In Sri Lanka prescription drugs are provided by a government owned pharmaceutical manufacturer. This qualifies as a form of state funded universal health system even though it’s not as developed as other systems.